Each of us possesses the ability reduce the volume and toxicity of those wastes we generate and ultimately introduce into our living environment. We do this by learning about and practicing what is called source reduction. 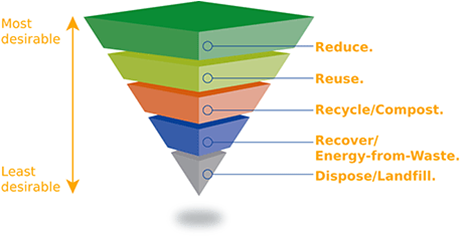 Source reduction can preserve our limited natural resources and conserve energy, and it can reduce the disposal burden on our landfills and transfer stations. It can also reduce the potential for harmful pollutants to negatively impact our health via contamination of our drinking and recreational water supplies, while protecting our local flora and fauna. There are several different methods of source reduction. Some can be practiced in the home while others are related to the products we manufacture or purchase. The following are a series of source reduction techniques you can practice. Below are examples for source reduction at home that are easy to do. Residents should be encouraged to pick a few activities to start. Practice water and energy conservation. Eliminate disposables! Use washable dishware at home and on outings, refillable razors, and cloth napkins and handkerchiefs. Wrap presents in old maps, the comics or a paper bag that has been decorated. Share magazines with friends and community facilities such as day-care centers and retirement homes. Purchase items that have the least amount of packaging; do not use unnecessary bags for items such as apples, potatoes and oranges; and bring your own canvas bag to the grocery store. Start a garden to get fresh food from the backyard instead of packaged food from a store. Composting is a method of recycling your yard waste that’s capable of producing a nutrient rich byproduct which can be used to feed your growing landscaping. A compost pile can be developed from the leaves you rake, the grass you mow, and even the branches you trim. Composting can save landfill space, while providing you with a no-cost nutrient-dense soil in which your plants may thrive. It is produced when yard waste and other organic matter is broken down by bacteria and fungi and made into a recycled form of ‘plant fertilizer’. It only takes a little time and attention. For most homeowners, grass clippings and leaves are found in abundance around the yard. Luckily, leaves and grass are also great ingredients for building compost! Others materials suitable for composting include: weeds free of seed heads, crop residues, vegetable and fruit peelings, coffee grounds, crushed eggshells and other similar kitchen wastes, sawdust, hay, and straw. Materials NOT suitable for composting include meat and dairy wastes, as these will surely attract animals and insects. One way to reduce yard trimmings involves the natural decomposition of lawn clippings that remain on the lawn after mowing. Grasscycling is recommended for established lawns. Determine if the product is really needed or if there are alternatives to purchasing a new product such as renting, borrowing or purchasing the item from a reuse shop. Investigate items around the house that could be substituted or made into the new product. Purchase only the items needed; for example, to avoid storing food that may spoil, paint that may need to be discarded, or household and lawn chemicals that may have a short shelf life. Avoid purchasing items in bulk that may not get used before their expiration. Instead of pesticides, use beneficial insects, companion planting in the garden, and hand-picking to ward off certain pests. Use water-based paint instead of oil-based paint to eliminate the need for paint cleaners. Assure proper dilution of condensed cleaners and consider using multipurpose cleaners rather than a specific cleaner for a specific job. Some manufacturers are now making this easier by providing refillable products or reducing wasteful packaging. Simply by paying attention to packaging and selectively purchasing you can have a substantial impact on both household and community waste streams.